Each year in southern India, millions of fervent Hindu worshipers endure a dangerous trek up a holy mountain, called Sabarimala, to pay homage to the Hindu god Ayyappa. In the mid-1990s, a 15-year-old boy named Aji Kumar joined the treacherous journey to fulfill the vows his Hindu parents had made to their god. Previously, the tedious worship of multiple gods proved unfulfilling for Aji. This pilgrimage, he hoped, would change that. According to legend, Ayyappa, one of more than 30 million gods in the Hindu religion, is a protector from evil and giver of good fortune. In preparation for the trip, Aji fasted for 41 days. Weak and malnourished, the teenage boy hiked up the 3,000-foot mountain without shoes, in accordance with sacred tradition. Aji was tired and afraid. Pilgrims literally fight each other to get to the shrine; in 1999 a stampede of worshipers killed 53 people. Along the way, Aji bathed in the Pampa River, which is said to release a person from a lifetime of sins. When he finally reached the 18 stairs leading to the shrine, he was so exhausted that he dropped the sacred articles he was carrying, and a policeman had to help him. For years, his family adhered to the meticulous Hindu traditions. They attended temple services and followed specific worship creeds. They routinely bathed, fed and garlanded the idols. But they felt no peace. Currently, Hinduism is the third-largest religion in the world. Hinduism can be traced back to ancient Indian seers who transmitted to their followers their ideas about ultimate truth. The earliest Hindu writings date from roughly 1500 B.C. There are a variety of sacred writings—the Vedas and Upanishads. The Code of Manu set down many prescripts for life, including the caste system—a social structure based on birth and wealth. At one point, a Christian explained how Aji could know Jesus personally, how Christ came to set people free. But Aji continued to worship Hindu idols. When he found his mother reading the Bible one day, he was furious. Tradition says that if a Hindu does not obey the stringent requirements of his gods, sickness and calamity will afflict him. Suffering is explained through karma, the idea that a person carries the collective force of his actions. Hinduism literally means “religion of India.” Currently, 82 percent of India’s population are professing Hindus. The religion is so tied to the heritage of India that the idea of worshipping only one God, like in Christianity, is offensive. Aji belonged to a political group that persecuted Christians, interrupting church services and other Christian meetings. During the Hindu festival of Onam, Aji and others from the political group set out to sabotage a Christian meeting at a local college. Armed with sticks and stones, they planned to disconnect the sound system’s power supply. Before they could cause a disturbance, a speaker announced, “Who is Aji Kumar, who has come to disrupt the meeting? The speaker continued, listing specific sins Aji had committed. Aji was astonished—and angry. He didn’t want to listen to the man and was embarrassed in front of his friends. Aji felt a sensation of extreme heat in his body, “like I was sitting on fire,” he says. His heart tugged at him. Finally, he stood up, joined the speaker, and prayed and received Christ. Soon after, Aji began studying the Bible. As a result of his faith, several in his family abandoned their idols and received Jesus. Today, Aji works as a missionary in India. Hinduism is a difficult religion for Western Christians to classify. With a kaleidoscope of gods, there is no central creed or founder, and no universal text on which the faith is based. Instead, it is a religion of relativism, where few Hindus worship the same way. This actually appeals to many Americans, explaining why more than 1 million practice some form of the religion stateside. Westernized Hinduism is often philosophical. It may include practices such as meditation, yoga and rituals. 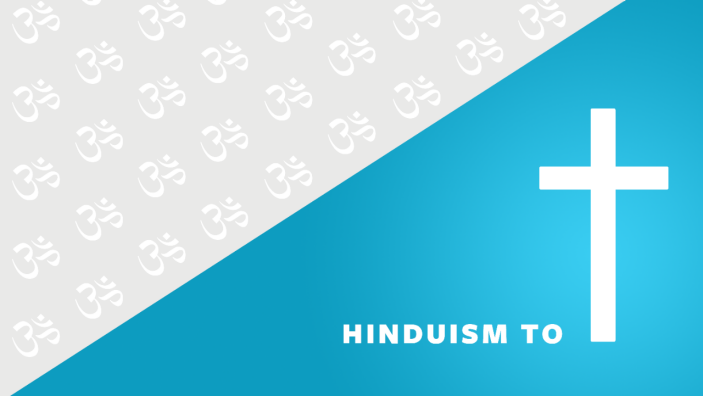 “Hinduism is more a way of life than a religion,” says Madasamy Thirumalai, the author of Sharing Your Faith with a Hindu. For Aji, it took a personal encounter with God to bring him out of that way of life. “In Christianity, I found there is a living God who loves me,” he says.